If Theresa May wasn't such a weak and directionless leader the under-secretary of state for Brexit Steve Baker would be in serious trouble for the lunatic conspiracy theories he's been spewing in the House of Commons. The Brexiteer conspiracy-mongering began in response to Buzzfeed getting hold of a leaked copy of the Tory government's damning Brexit impact assessment. The conspiracy theory was introduced into the House of Commons by Jacob Rees-Mogg, who is the leader of the hard-right ERG Brextremist pressure group that Baker himself used to lead until Theresa May promoted him into her government. The conspiracy theory is that someone called Charles Grant from the CER had uncovered plot by civil servants to "develop an economic model to show that all [Brexit] options are bad". Instead of dismissing this bonkers conspiracy theory as the nonsense that it is, the Brexit junior minister Baker responded by saying "I'm sorry to say that my honourable friend's account is essentially correct". Opposition MPs reacted furiously to this attack on the impartiality of the civil service and Charles Grant immediately released a statement that "I did not say or imply that the Treasury had deliberately developed a model to show that all options outside the customs union were bad with an intention to influence policy." The leader of the civil servant's union Dave Penman slammed Baker's conspiracy-mongering by saying that "to stand at the despatch box and refuse to challenge a half-baked conspiracy theory about the civil service - one that even now is being disowned by its supposed source - is the height of irresponsibility from a serving minister." Penman went on to say that Baker is "incapable of separating his ideological position from being a minister of state" and called on Theresa May to reflect on whether he's fit to be a government minister. Aside from attacking the civil service Baker also provoked fury by claiming that the Brexit impact assessment should not be believed because all government reports are "always wrong". So here we have an actual government minister undermining the government and the civil service with crackpot conspiracy theories and claims that all government research and evidence is worthless, yet Theresa May does absolutely nothing to hold him to account. The reason for her cowardice is obvious. Both Baker and Rees-Mogg are influential members of the secretive ERG Brextremist pressure group. May knows that this group has sufficient members to force a vote of no-confidence in her leadership, so she doesn't dare stand up to them in any way. In fact she keeps bribing them by promoting their leaders into her government. First she promoted Steve Baker, then Suella Fernandes in her shambolic January cabinet reshuffle, and now their new leader Jacob Rees-Mogg is clearly angling for a similar promotion. 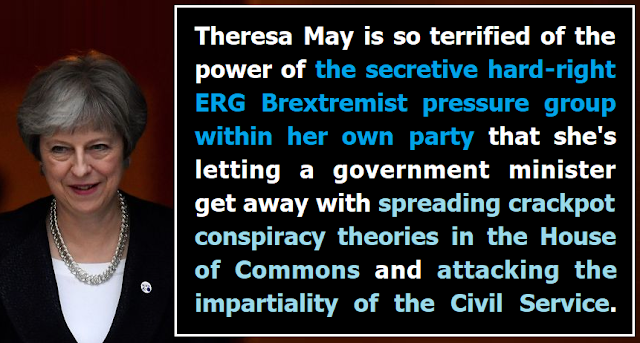 May won't punish Baker or Rees-Mogg because she's terrified of them, so instead she's been throwing a load of red meat to the baying ERG dogs with a renewed attack on the rights of European citizens and a public dressing down for the Tory MP Phillip Lee who dared to suggest that the government should be led by "evidence, not dogma". Incredibly Lee was disciplined by Theresa May's whips and told to air his (actually incredibly sensible for a Tory) views "in private", while Baker and Rees-Mogg have been let off scot-free for airing their bizarre conspiracy theory in the House of Commons, and bringing the government and the civil service into disrepute. It's quite clear that Baker and Rees-Mogg's decision to engage in bizarre Brextremist conspiracy-mongering right underneath Theresa May's nose is a way of demonstrating their power over her. As long as they go unpunished they've proven to the rest the Tory party that they're an untouchable faction who can do and say whatever they like with total impunity, while anyone else who steps out of line from the Brextremist agenda will be hit by waves of abuse and death threats sent by the vile hard-right Blue-Kip mob that Theresa May has welcomed into the Tory party with open arms. This debacle just goes to prove once again that Theresa May is a pathetically weak and directionless leader who is totally in hock to the hard-right Brextremist faction of her party.